ABI REIMOLD TTN Sophomore shortstop Sarah Prezioso bats .373 on the season to lead the Owls’ offense. The New Jersey native attributes her hot-streak to self-confidence and routine. Sophomore shortstop finds an elevated game after poor start. Sophomore shortstop Sarah Prezioso, who earned back-to-back Atlantic Ten Confernence Player of the Week honors for the weeks of March 11 and 18, plans to hold onto those new gloves. Currently Prezioso leads the Owls in multiple statistics, including batting average, reached base streak, as well as multi-hit games and multi-RBI games. Prior to game two of the doubleheader with Wagner on Tuesday, March 27, Prezioso also led the team with a 14-game hitting streak. It seems as though the Bloomfield, N.J. native is only getting started in the batter’s box this season. The 5-foot 9-inch right hander improved her batting average to .373 after going 4-for-7, adding three RBI and two runs scored in the Owls’ doubleheader sweep of La Salle on Friday, March 30 at Ambler Campus. But starting the season wasn’t easy for Prezioso, who went a combined 5-for-34 in 12 games before recording her first multi-hit game of the fall against East Tennessee State University on March 10, when she went 2-for-3 with a run scored in the Owls’ 4-3 win. Not only does Prezioso perform well at the plate, she also produces in the field. Throughout the doubleheader on Friday, Prezioso made multiple plays to keep the Explorers’ off the bases. Prezioso’s overall performance helped the Owls win 4-3 in the first game and 8-0 in the second game against the visiting Explorers to keep Temple undefeated in Atlantic Ten Conference play [16-11, 4-0 A-10]. “She’s really turned it on, she’s seeing the ball much better, in the last three weeks she’s been hitting the ball better than anyone,” DiPietro said. Prezioso’s ability to boost morale is an asset to the team well, DiPietro added. 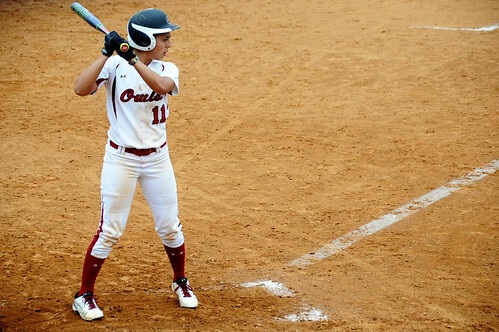 In her first season with the Owls, Prezioso started all 45 games and hit .290, although she admits she was not always so confident in her game. DiPietro is excited about the entire squad, which is off to its best conference start since going 4-0 in 2003. Last season the Owls advanced to the A-10 tournament for the first time since 2007, finishing fourth. DiPietro is hoping Prezioso will take more of a leadership role in the future. For Prezioso it is all about staying calm and following routine. “Before I get into the batter’s box, I take two swings before I get in just to feel good, and I always jump over the foul line, I never step over, always hop over,” Prezioso said.